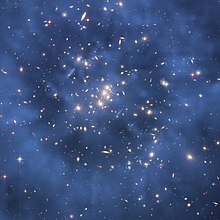 Welcome to the Wikiversity learning project for Dark matter. Non-baryonic dark matter matter - review by Paolo Gondolo (2004). Investigation of possible dark matter direct detection in electron accelerators - by Junji Hisano, et al (2006). Observational Evidence for Extra Dimensions from Dark Matter by Bo Qin, Ue-Li Pen and Joseph Silk (2006). Mnemtronium - an attempt to "think outside of the box" and link some "psychic phenomena" to dark matter.